All the news that's fit to nom. As is frequently the case, there's lots of food-related news from Oakland. I experienced some new and new-to-me tastes at the recent Oakland Indie Awards. 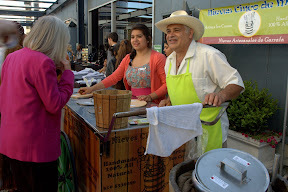 A new-to-me taste was Nieves Cinco de Mayo, which has a shop in the Fruitvale Village complex. Along with more standard flavors like strawberry (made with berries fresh from the farmers market) and coffee (made with Blue Bottle Coffee), they also feature flavors like corn and key lime, depending on what's in season. Read more at Oakland North. I'm planning to check them out more fully next time I'm in the area on a warm day. One of the most popular food vendors giving samples at the Indie Awards was Victory Burger, which will be around the corner from Actual Cafe. They successfully raised $25,000 for the build out of the space on Kickstarter so hopefully it's all going forward as planned. The vegi option was good, and the homemade pickles are fantastic. Another new-to-me taste at the JLS Night Market was Cholita Linda. There was a good-sized line, but someone said, "It's worth it. They have the best tacos." K and I shared some fish tacos and some tofu tacos (made with Hodo Soy tofu), and they were amazing—definitely worth waiting for. Phat Beets Produce has been at the north Oakland farmers market at the Arlington Medical Center for a while. They recently moved a few blocks away to Stanford and Lowell. But they're also planning a healthy cafe and a commercial kitchen for aspiring food entrepreneurs. The East Bay Express has the full story. Big food news for East Oakland. Kroger, the largest supermarket chain in the U.S., will be opening a Foods Co. supermarket and drugstore at the Foothill Square shopping center on 107th Ave. and MacArthur. CM Larry Reid is excited about it, and presumably area residents are, too. The Oakland Tribune has the story. Linden Street Brewery received a well-deserved award for their Burning Oak Black Lager, Best Local Beer as voted in SF Weekly. Congrats to Adam and his crew! The East Bay Express a nice write up of Kamdesh Afghan Kabab House on 14th Street, and the challenges of getting used to a new cuisine. Sounds tasty but a bit meat-centric for my vegetarian ways. I saw a blurb on SFGate that pointed me to Oliveto's ongoing series about food, It's Complicated: A Series of Conversations about Eating, Cooking, and The Politics of Food. Past events in the series include Our Local Seas: A Comeback Story and Building a Local Grain Economy: A Kitchen Table Talks Production. Coming up in September is Grass-Fed Beef, when the panel includes local food writer Michael Pollan. Some closing I heard about last month have come to pass. Tully's closed their Oakland branch across from city hall, but they still have branches in Berkeley, Pleasanton and San Francisco. Much more surprising was the sudden closing of B Restaurant. I still haven't made it over to West Oakland to check it out, but Eat Drink Oakland has some gorgeous pictures of the food from Fuse BOX. As noted, Kitchen 388 on Grand Avenue has reopened, with more focus on dinner. According to the East Bay Express, you can also order their food to be delivered across the street to coffee house / bar Room 389. I haven't been to Room 389 yet, but Sweeeeet Oakland loves it. Speaking of which, Sweeeeet Oakland also loves the recently opened Donut Savant on Broadway. Their tip: ask what's fresh and may be still warm! Read more at the East Bay Express. I missed the article back in April, but Tablehopper says that Charlie Hallowell of Pizzaiolo and Boot & Shoe Service is planning a new place across Grand Avenue from Boot and Shoe Service that will also be a full-service butcher shop. Speaking of meat, Oakland urban farmer and writer Novella Carpenter has an interesting essay, "Why I Eat Meat". Old Oakland will be getting a new place, a branch of Rosamunde Grill which features grilled sausage and craft beers. According to the San Jose Mercury, it's scheduled to open later this summer, but if you can't wait that long you can sample their fare at a popup at Classic Cars West along 26th Street, Saturdays from noon to 8pm. SFGate's Bar Bites has a nice review of Caña, the Cuban restaurant on Lake Park bear the Grand Lake Theater. I haven't been yet, but a recent discussion on Twitter about plantains makes me want to go. Oakland and its amazing food scene continue to attract attention from all over. The Boston Globe has an article titled, "Leave your heart wherever, but eat in Oakland". It talks about the food scene, and mentions Plum, Blackberry Bistro, Brown Sugar Kitchen, Picán, Barlata and others before launching into a full-on list of restaurants by neighborhoods. Speaking of Brown Sugar Kitchen, there's some local love for Tanya Holland's B-Side BBQ in Diablo Magazine. Number 42 on their list of 50 Things You Gotta Do This Summer is dine at B-Side BBQ on San Pablo. The website lists some non-meat options, so I might even try it. and a bunch of things not focused on food and drink, like #25 - camping at the Oakland Zoo, #22 - renting a boat at Lake Merritt, and more. Last but not least, there's a new food truck pod in Oakland, The Eatup, Fridays, 6-11pm at 21st and Telegraph. I haven't been yet (nor to the Clay Street Food Pod), but hooray for more food options in Oakland!